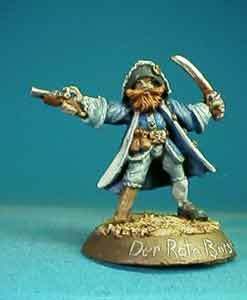 US-based online retailer and manufacturer of Gaslight, WW1 and Victorian age miniatures, Brigade Games at some point announced an upcoming range of pirate miniatures. 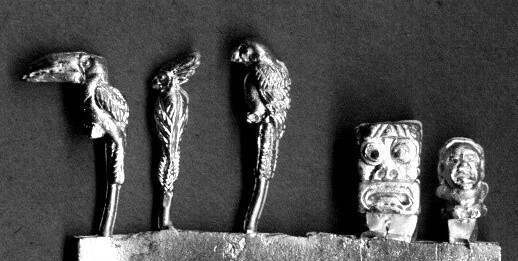 While this project seems to have gone the way of the dodo, the "Carribean Empires" range has some useful parrot and idol bits. 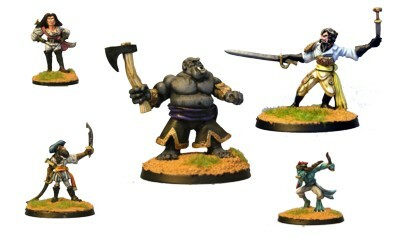 This German company makes sf-miniatures for the "Fearless" game, and generic fantasy miniatures. 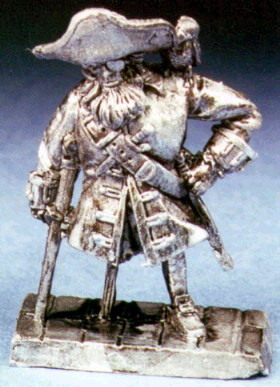 The fantasy range includes two interesting pirate figures in the "Adventurers & Warriors" subsection. 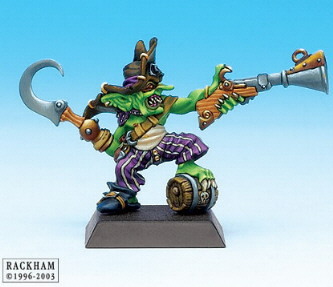 The Red Borgil is definitely a pirate captain, with the mandatory peg leg. 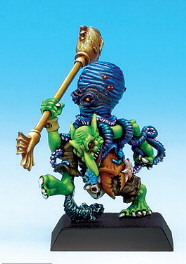 The other one, Drake, is a more modest character, although the pose, with one foot resting on what appears to be a treasure chest and the pet parrot will certainly draw some attention to him. Both models appear very well sculpted and come with plastic bases. Another manufacturer that's been around for ages on the historical scene. 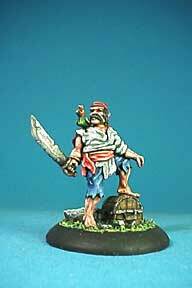 While not up to the quality of their recent viking range, the Dixon pirates are quite decent models. 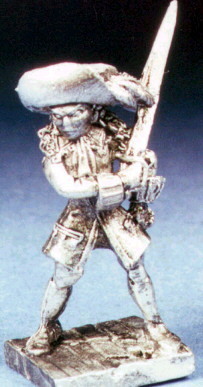 The range includes regular pirate crews, labourers, gun crews and personalities. I know they also make/made some ships. Everyone knows the French company that produces those lovely Confrontation figures by now. Do they produce pirates? 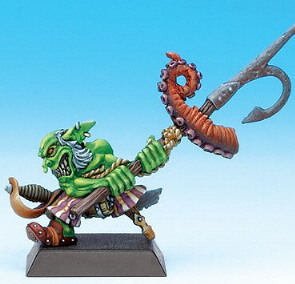 Hell no, but they have a full goblin clan box called the "Skimmers of the Oceans", which holds 9 splendid goblin pirates and a cannon. Well... 8 goblins, a monkey and a cannon, but anyway... 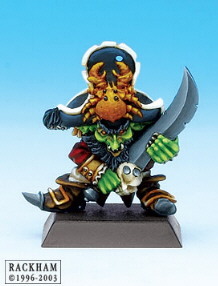 The crew is made up of a captain with suitably large hat, a sorcerer wearing a squid on his head, a first mate with parrot, a goblin diver, 2 regular crew with halberds/harpoons, 2 gunners and the aforementioned monkey who answers to the name of "Baron Samedi". The regular crew and gunners are also available in separate blisters. 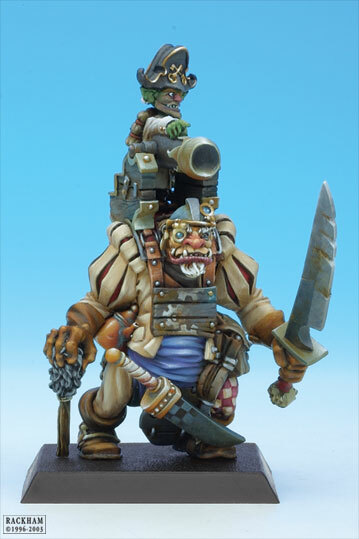 A further addition to this crew can be found in the mercenary Ogre Boutefeu. 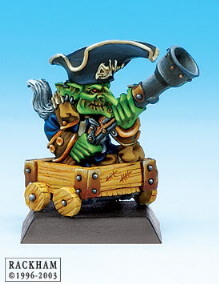 After all, he does have a goblin pirate cannon and crew mounted on his shoulders. 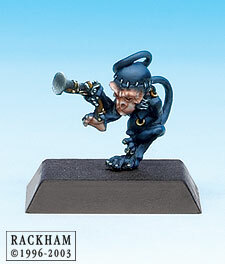 Lastly, the Black Troll is swinging an anchor for his weapon and could be included in your crew. The manufacturer of the Gothic Horror, Dwarf Wars, Cowboy Wars and many other ranges teams up with Pinnacle Entertainment Group (producer of games such as Deadlands, Savage Worlds and Weird Wars) to produce the Miniatures for 50 Fathoms. 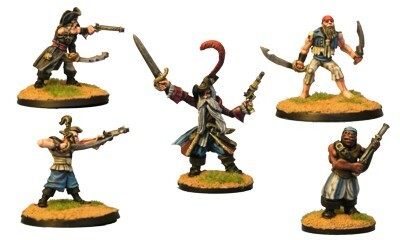 While I couldn't find any pirates in their historical range, the fantasy range has a few nice figures in the "Player Characters" section, being a "complete" pirate, with eyepatch, pegleg and parrot (only the hook is missing, but that would be a bit overkill perhaps...) and a dashing female pirate. These figures come with solid metal bases.